This image shows a 7.2 kV (medium voltage) power cable system at a co-op utility in rural Missouri that supplies power to a residential area. 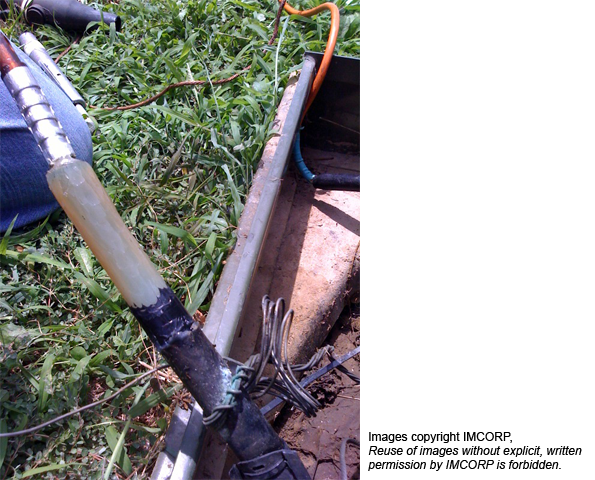 IMCORP's Factory Grade® assessment indicated PD activity at the separable connector of this particular cable system. Upon further inspection, IMCORP determined that the cable was not IEEE 386 compliant. The semi-conductive material was not prepared in a smooth radial cut pattern (as is required) but rather in a jagged, non-uniform way. In addition, the insulation between the semi-con and the stress relief element (elbow) had been haphazardly gouged and whittled down. The stress relief at the termination is dependent upon proper semi-con cutback and insulation. If this issue were not caught in advance by IMCORP and promptly mitigated, the utility’s customers may have experienced power outages as a result of a termination failure.